One of those things that sounds really complex in an inside-the-engine kind of way but turns out to be pretty simple. There's a few ways to do this, but I found the easiest is the way explained in John Twist's video. Take off the rocker cover and then, with the HT lead disconnected, turn over the starter, just momentarily. 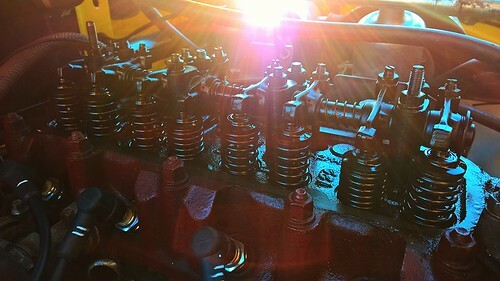 This obviously rotates the camshaft, but the engine settles with one valve open allowing you to adjust the opposing one (using the rule of nine outlined in the video). Turned out around half the valves were good and half were a little tight and had to be backed off.